Children are very effective change agents, this has been proved by the children of Jalal Colony, Ward No. 19, Aurangabad. Earlier piles of garbage could be seen everywhere in this colony, but after being triggered on segregation of waste and waste management by Feedback Foundation (FF) team, AataMajhiSatakli group of children was formed. These bunch of enthusiastic children took active part in the ‘No Open Waste’ Campaign immediately when they understood that they could do some ‘herogiri’ for a noble cause. They pledged to make their colony clean and did Swachhata Rally spreading awareness on segregation at source, went door to door with FF team and ensured segregation is done at source. Composting pits have been made and wet waste is put there by the residents now. Dry and hazardous waste is collected by a vehicle from Corporation every Wednesday. Recycleable waste is being recycled and as a result Jalal Colony became No Open Waste Colony. The dedicated efforts of these children was applauded by the Commissioner, Dr. NipunVinayak. 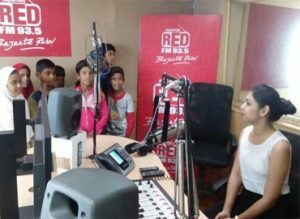 When Red FM 93.5 Aurangabad came to know of this AataMaaziSatakli Gang, they invited them to their studio and interviewed the children about their contribution and great achievement.